There's two things I'm always looking for in my Samsung Galaxy Note 2. Efficiency and quickness. So, like any other softModder, I tend to download a bunch of apps and tweaks that help speed up my device's overall performance. In doing so, I often come across the "Complete action using" popup, which is oddly enough, one of the most inefficient features ever. You'll see this popup whenever you click on something that can be opened with more than one option. 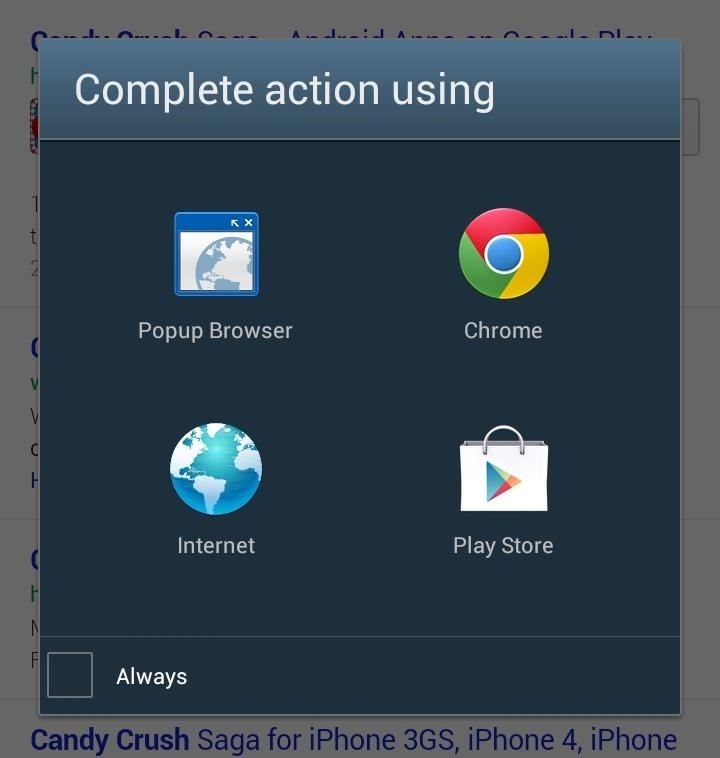 If you click on a link in Google search for an Android app, you'll be asked to open it with Internet or Google Play, maybe even Chrome or another browser you have installed. 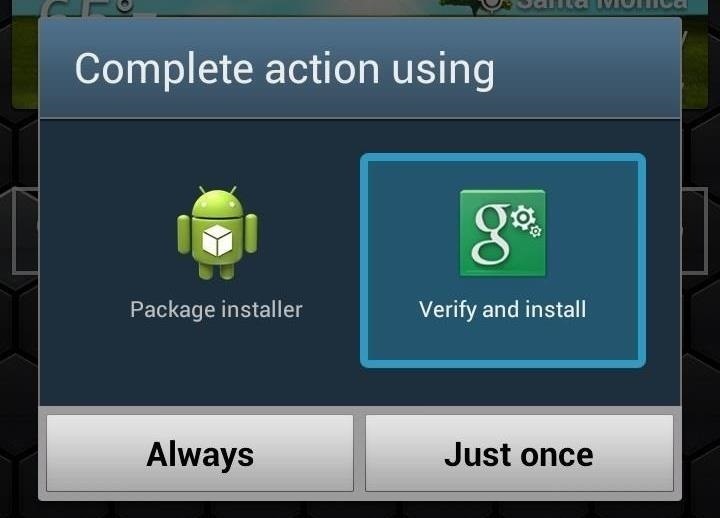 If you're opening an APK file, you'll be asked for Package Installer or Verify and Install. 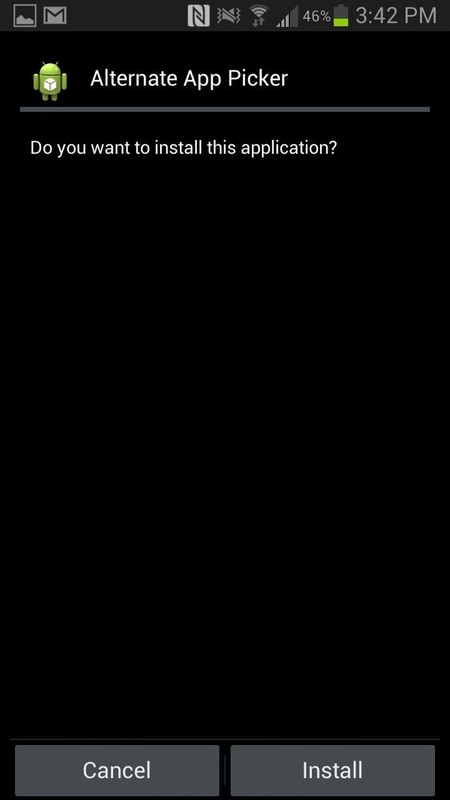 When this "Complete action using" menu appears, you not only have to select an option, but then hit Just Once as well, making it a double-tap task. Sure, you could select Always and not have to deal with it again, but those type of set-in-stone features aren't something that I'm too keen on, and changing those settings are a pain. In today's softModder tutorial, I'm going to show you how to accelerate the "Complete action using" process by modifying it to a single-tap action with Alternate App Picker, an Xposed Framework module from dev qwerty12. If you're not already rooted, check out our complete softModder guide to doing so using ODIN for Windows. Also, make sure to back up your device, just in case. Both the Alternate App Picker and Xposed Framework are not from Google Play, so you'll need to have Unknown sources checked. Enable it by going to Menu -> Settings -> Security and checking it. Since the Alternate App Picker is an Xposed module, you'll need the Xposed Framework installed. To get it on your Note 2, do the following. 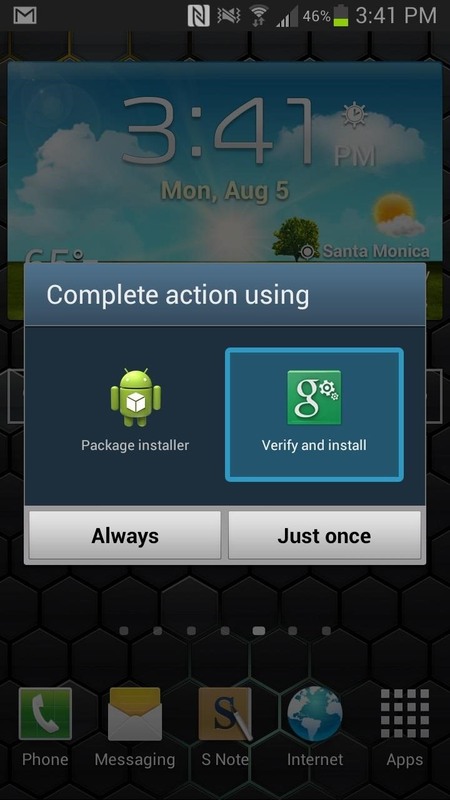 Download and install the Xposed Installer APK onto your device. 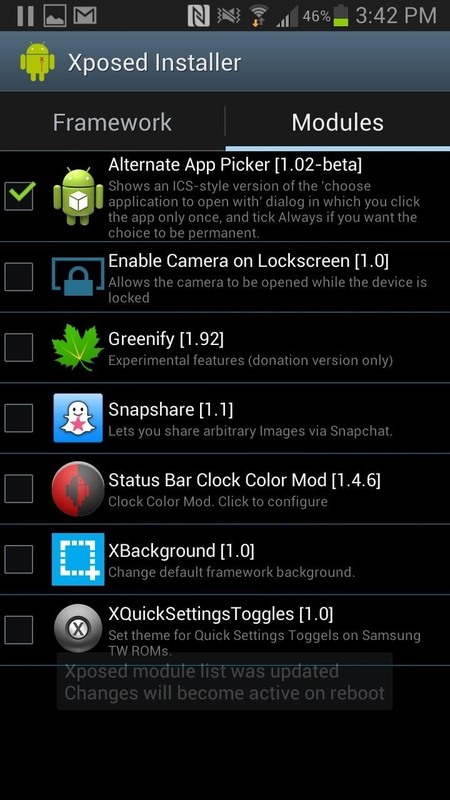 After your Note 2 reboots, download (and Verify and Install) Alternate App Picker. Once the installation is complete, head over to Xposed Installer app, tap on Modules, and make sure Alternate App Picker is checked. Head to the Framework tab and either Soft Reboot or Reboot your device. Now that your Note 2 is ready to go, try opening a link that causes the "Complete action using" popup to appear. I did it with random download link from the stock Internet browser, and this is what the redesigned pop-up will look like. Now, instead of having to tap on the app and Just Once, I just have to tap on the app and the link will open directly. If I want it to open with the same app for good, I can just check Always at the bottom. While it may not seem like huge difference, the double-tapping annoyed me and wasn't as fluid as I wanted it to be. Now, the process is much smoother and quicker than before.